Crikey, it's Core i7 inside! Novatech's highest end gaming laptop, the X90 GTX Pro, has something very familiar about it. The Clevo chassis in which it's clad is put together well enough, but we've seen it before in machines like the Dell XPS M1730 and Chillblast Fusion Genesis. That's not necessarily a bad thing as it boasts exceptional build quality: heavy, but flawless. For example, there's none of the telltale play in the hinge which characterises so many floppy laptop screens, and the keyboard doesn't feel like it'll bounce out of its mounting and slap you if you strike it too hard. There's also not a poor seam or gappy joint anywhere to be found, and every single port has a fine finish rather than the 'barely flush, but lets jam it in and hope for the best' manufacturing approach taken by far too many others. The metal latch and aluminium finish round off a look which is classy enough, but designed by a man who clearly believes everything he's told. Like 'size isn't important' – this is a huge scary beast of a computer. To be fairer to both Clevo and Novatech, there's actually a hint of BMW-like practicality about the X90's enormity: and at 5.4Kg it's just as well. To continue the car analogy, the front face, normally wide enough to accommodate nothing more than a wireless on/off switch, is home to forward mounted speakers, which thanks to the gun-metal finish don't look completely unlike the radiator grill of a certain German automotive manufacturer. They sound great too, but thin they ain't. The pragmatism continues underneath. If you have the strength to lift it up and examine the bottom, you'll notice that the feet aren't mere pads to stop the bottom getting scratched. The large rubber legs at the back help to rake the keyboard and make it easier to type on, even if they do make slipping the whole thing into a bag slightly tricky. We could go on and rave about the fit of the milled metal shortcut buttons (even the two which seem to serve no purpose) like some lunatic property show presenter, but for a generic chassis that's probably enough. After all, it's what's inside that counts, isn't it? Before we get onto the innards, an aside. There's a dilemma approaching for laptop manufacturers, who've long been used to watching their revenues grow at the expense of desktop sales and have carved up their product ranges into now tired headings like 'thin and light', 'entry level', 'mainstream' and 'gaming'. For years, the received orthodoxy has been that tower PCs are on their way out, to be replaced by the greater flexibility of the notebook. Under this system, the X90 GTX is a 'desktop replacement', designed not for portability but for someone who will rarely move it from one spot, yet either craves the theoretical ability to schlep it round with them or doesn't have the space for a full tower system and monitor set-up. And no, that doesn't just mean students. Although they are a good example of why buying laptop which will, essentially, remain static, is not such a stupid idea. There are two problems converging to destroy this business model though. The first is that with the advent of cloud computing and the reliability of Google Apps et al, we can get by with a lot less in the way of on board power these days. Games engines aren't getting much more complex than they were four years ago, and you can get most titles running on Nvidia and AMD's lowest end GPUs if you have to. Throw in the fact that phones are so much more powerful and usable now than they were two years ago and many of us are beginning to wonder if we need to take a laptop with us at all when we go out now. After all, if there's an app which means I can write up a press conference onto Google Docs from my iPhone – why bother taking a laptop with me as well? The second problem is that people are a tad more wary about what they spend on new technology these days, to the extent that analysts at Gartner are predicting a 30 per cent fall in year on year sales of desktop PCs in 2009. That's huge, and only slightly compensated for by a small rise in laptop sales – nearly all of which will be accounted for by netbooks. As far as we can see, there are two sensible ways for things to go. 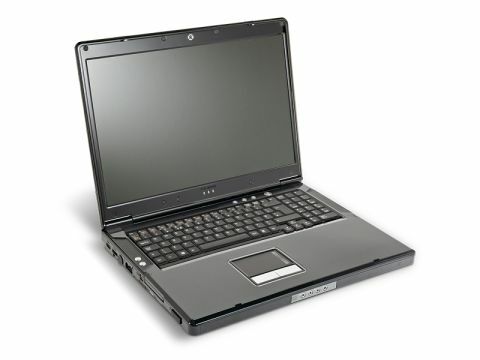 Either everyone gets a netbook or a good phone for computing on the go and picks up a powerful but reasonably priced desktop for home; or, if space is an issue, you use a netbook or a phone for out and about and get a machine like this – which is good at offline stuff like games and video encoding – for home. Either way, it's the middle-of-the-road laptop which should be vanishing. Of course, that's not what is actually happening right now and may well not be the way things go in the long run, but for the likes of the TechRadar reader, it might make sense.